Curriculum Design needs a reboot. Turn the machine off, count to five, and power it back up again. The system has been “on” too long and we’ve reached our limit of redundancy looping warnings. It’s time to upgrade the operating system, to invite innovation, and to become contemporary teachers of contemporary learners. 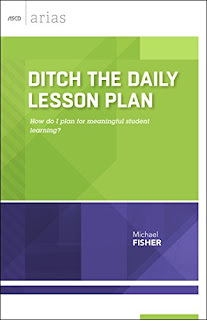 One week from today, I’m pleased to announce that my new ASCD Aria, Ditch the Daily Lesson Plan will be available. It’s a book designed to be read one day and acted on the next. It’s a book that is full of strategies to plan curriculum design in ways that invite learner involvement, minimize daily documentation, and get to the heart of authentic ways to teach and assess students and their learning. This is a book unlike any I’ve written before. It comes from observational and anecdotal data gathered in the last few years of working with schools around modern instructional methods, where “what-ifs” became “what-nexts.” In the book, I share three different alternatives to traditional curriculum design that include the creation of Mini-Units, an all-inclusive Curriculum Cache, and a journey inspired Triptik™ model that relates the awesomeness of the AAA Travel Planner to contemporary curriculum design. The book also includes a list of other stalwarts of instruction to ditch including the lecture, internet filters, worksheets, and more. I’m so excited to share this new work with you and I’ll be sharing extensions of the work here in the coming weeks, so that the original text will serve as a launching pad and I’ve got plenty of material to fuel the fire. Contemporary students need contemporary teachers. I hope you find what I’ve written to be a step that direction. This book is 100% a partner with my previous Aria, Digital Learning Strategies, and between the two I hope that I’m hitting the sweet spot of the overlap between 21st Century Ideas and Contemporary Curriculum Design. Both are important for today’s learner. Stay tuned. Next week I’ll share some of the additional ideas that I had for the new book as “Curriculum B-sides.” While these ideas didn’t ultimately make it into the text, they are still potential discussion points for making curriculum design more contemporary and inviting for multiple stakeholders in your curriculum conversations! ™Trademark for Triptik belongs to the American Automobile Association, used with permission.